Join Adam Hamilton in Exploring Popular Sayings that Miss the Point. 2. God helps those who help themselves. 3. God won’t give you more than you can handle. 4. God said it, I believe it, that settles it. 5. Love the sinner, hate the sin. All true? Not so fast. We’ve heard these phrases all of our lives, but in Adam Hamilton’s new book, Half Truths, you’ll learn that although they capture some element of truth, when compared to the wisdom found in Scripture, they’re really just popular sayings. The five-week, DVD study can be used in small groups or as a churchwide program where all ages explore the topics at the same time. Leader Guides for adult and youth are also available. True or false: 1. Everything happens for a reason. 2. God helps those who help themselves. 3. God won’t give you more than you can handle. 4. God said it, I believe it, that settles it. 5. Love the sinner, hate the sin. All true? Not so fast. 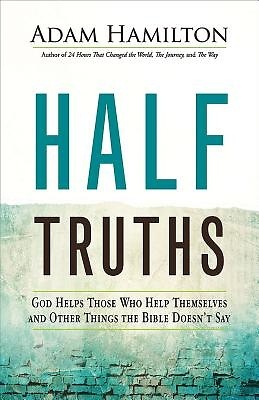 We’ve heard these phrases all of our lives, but in Adam Hamilton’s new book, Half Truths, you’ll learn that although they capture some element of truth, when compared to the wisdom found in Scripture, they’re really just common Christian clichés. The five-week, DVD study can be used in small groups or as a churchwide program where all ages explore the topics at the same time. Leader Guides for adult and youth are also available.